Midwest Aerial offers clients the option of requesting airborne acquisition with either a digital imaging sensor or a traditional film camera. To acquire accurate airborne digital imagery with high spatial resolution, we own and operate three Z/I Imaging DMC II digital mapping cameras. These large-format sensors mimic the frame geometry of traditional film cameras while providing unparalleled image sharpness and multispectral information content. 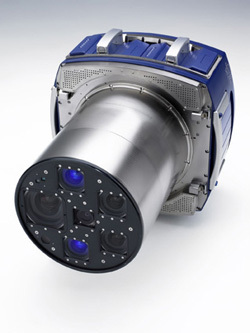 The DMC II’s acquire black-and-white panchromatic and multispectral color (Red, Green, Blue and Near-Infrared) imagery simultaneously on a single pass. The digital cameras are extremely cost-effective for wide-area coverage projects. From a practical perspective, digital imaging offers rapid turn-around time as its most important benefit. Compared to film photography, digital image acquisitions can be pre-processed and ready for delivery within 24 hours after the flight is completed. We typically have pre-processed image data on our FTP site or saved to a disk for courier delivery just hours after the plane lands. This rapid turn-around makes our clients and business partners more competitive in an industry that increasingly demands fast response and digital products. In 2010, Midwest Aerial transitioned from film-only acquisition to include airborne digital imaging in our list of services. We selected the DMC II digital mapping camera from Z/I Imaging. We bought a second DMC II in 2011, becoming the first company in the world to own two of them. In 2012 we took delivery of our third DMC II system maintaining our lead as the world’s largest owner/operator of this high end direct digital imaging system. Our Digital imaging makes our customers and partners more competitive because the imagery can be processed faster than film, and the geometric accuracy and color fidelity of digital images are superior. The DMC II can also be operated in lower light conditions (overcast skies or low sun angle) than film. Designed specifically as a photogrammetric mapping camera, the Z/I Imaging DMC II offers a rigid square frame and a fixed pixel geometry in a single array that result(s?) in very high-quality geometric resolution. All DMC II systems collect four-band multispectral (Red, Green, Blue, Near IR) and black-and-white panchromatic imagery. Automated forward motion compensation and rapid refresh rate enable operators to fly the DMC II at low altitudes for large-scale survey applications and at higher altitudes for small-scale regional projects. Ultra sharp custom lens assemblies designed by Zeiss specifically for the DMC II camera system delivering highest resolution. 1:2 Pan Sharpening ratio – The only large format digital imaging system with a pan-sharpening ration so small. This produces the highest color resolution in the final image. 2.2 second system recycle rate between images to allow standard photogrammetric stereo overlaps at a one inch pixel GSD resolution. Ultra sharp imagery due to Forward Motion Compensation (FMC) using Timed Delay Integration (TDI) technology. One inch (2.5 cm) pixel Ground Sample Distance (GSD) resolution can be obtained. Gyro stabilized mounts to maintain a nadair view while also compensating for angular motion during turbulent air conditions to assure a clear sharp image even under less than ideal flight conditions. In modern aerial survey cameras, FMC technology eliminates the image motion caused by the forward motion of the aircraft. FMC can be used successfully in good weather conditions; however, the full benefit of image motion compensation becomes obvious only when the roll and pitch of the aircraft need to be compensated. 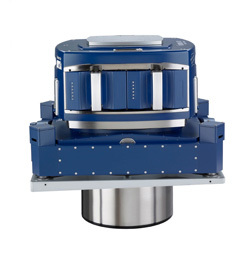 Prof. Karsten Jacobsen’s white paper on the geometric properties of the DMCII-140 camera. Klaus Neumann’s white paper about the improved technology regarding the DMCII-140 system.